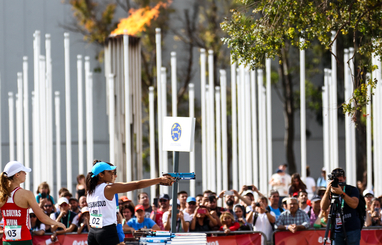 Salma Abdelmaksoud left all rivals in her wake as she became the third winner of Women’s Individual gold at the Youth Olympic Games and Egypt’s first Olympic pentathlon medallist at any level. Abdelmaksoud (EGY) moved into a strong position after finishing 3rd in Swimming and 6th in Fencing, enabling her to start the Laser Run 14sec behind the leader, Under 19 world champion Alice Rinaudo of Italy. When Rinaudo (ITA) lost momentum at the second visit to the range, Abdelmaksoud (EGY) pounced. The 18-year-old then kept her composure with two terrific shoots and strong running to leave the pack with no chance of catching her. Bronze medallist Michelle Gulyas of Hungary also overtook Rinaudo (ITA) and kept possession of 2nd place until the final lap, when she was passed by Emma Riff of France, who thrilled the crowd by claiming silver. 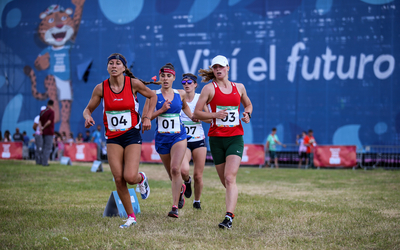 Capacity crowds had been a feature of the competition throughout Fencing, Swimming and Laser Run, and Argentina fans provided deafening support in each discipline for local representative Martina Armanazqui, who finished 7th in Swimming and Fencing and finally finished 10th. In 4th was Gu Yewen of China, one place ahead of Rinaudo (ITA) with Laura Heredia of Spain in 6th. Alida van der Merwe of South Africa, Annabel Denton of Great Britain and Anna Jurt of Switzerland also enjoyed top-10 finishes. Abdelmaksoud (EGY) now joins Leydi Moya of Cuba and Zhong Xiuting (CHN) in an exclusive club of Youth Olympic Games women’s champions, and her success is another milestone in the incredible journey of Egypt to the top echelons of world pentathlon, especially at under-age levels. Egypt will have another chance of a medal tomorrow in the Men’s Individual in the shape of Ahmed Elgendy, UIPM world champion at both Under 19 and Junior (Under 21) level this year. Indeed, Abdelmaksoud (EGY) has been progressing steadily since winning Mixed Relay gold at the UIPM 2015 Under 19 World Championships, an achievement she repeated this year before winning a breakthrough senior silver medal in the Mixed Relay at Pentathlon World Cup Sofia. 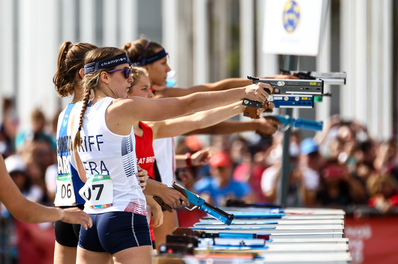 The silver and bronze medals completed an exciting summer for Riff (FRA) and Gulyas (HUN), who achieved the reverse results (bronze and silver respectively) in the Mixed Relay at the UIPM Pentathlon World Championships in Mexico City (MEX) last month. Riff (FRA) said: “I wasn’t sure how it was going to be after the Fencing but I’m so happy with this result – it’s totally cool. I wasn’t so good during the shooting but I think I made a difference during the race. 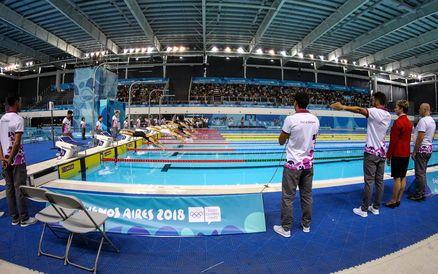 The atmosphere was electric at the Youth Olympic Park pool and an exceptional performance from Gulyas (HUN) drew admiring applause from the large crowd. She timed 2:11.16, almost 3sec faster than nearest rival Abdelmaksoud (EGY), who touched the wall in 2:13.87. Riff (FRA) was not far behind in 2:15.69. 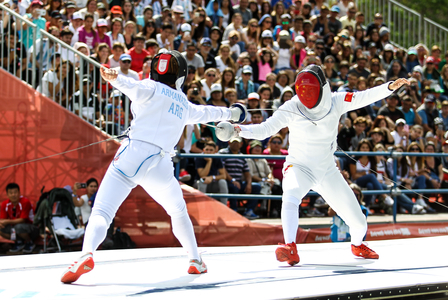 After she set a new world record for Fencing at the UIPM 2018 Under 19 Tetrathlon World Championships in Caldas da Rainha (POR), it was no surprise to see Rinaudo (ITA) top the standings after a fiercely competitive Ranking Round in front of full tribunes in Argentina’s capital. Rinaudo (ITA) scored 16V/7D to fend off competition from Heredia (ESP, 15V/8D), Denton (GBR) and Sofya Prizhennikova of Kazakhstan, both of whom scored 14V/9D. When the athletes returned for the Fencing Bonus Round inside the stadium at Youth Olympic Park, they discovered again that they would be watched by a big crowd but this time they were the sole focus of attention on the showpiece outdoor piste. 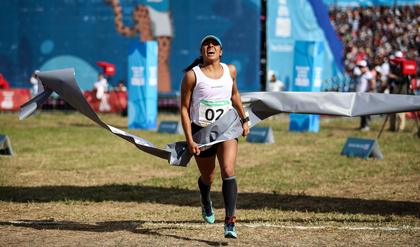 The athletes who thrived best in the limelight were Chen Yu-Hsuan of Chinese Taipei, who scored four victories, and Katsiaryna Etsina of Belarus (three). Prizhennikova (KAZ) also managed three wins in the elimination format and Abdelmaksoud (EGY) added two important points to her tally. When a reigning world champion embarks on a Laser Run with a significant lead, the chasing pack would be excused for thinking they might be battling for silver and bronze rather than gold. But while Rinaudo (ITA) started with a 45sec lead at the Under 19 World Championships, this time the advantage was 14sec and she did not have the composure to finish the job. With a pack of strong athletes – Gulyas (HUN) Riff (FRA), Heredia (ESP) and Denton (GBR) – behind her, there was also a lot of pressure on Abdelmaksoud (EGY) but she didn’t seem to mind one bit. The lead changed hands for the first and only time at the second shoot, and a 5sec gap became a 20sec gap when Abdelmaksoud (EGY) delivered again at the third shoot. She built on her lead during the third lap and entered the range with a 50m lead, which she duly protected with another nerveless shoot to ensure the top prize was hers. Behind her, there was a huge clamour for the podium and it was Gulyas (HUN) who exited the range for the final time in 2nd place, with Rinaudo (ITA), Heredia (ESP) and Riff (FRA) all in close pursuit. But it was Riff (FRA) who proved to have the strongest legs. 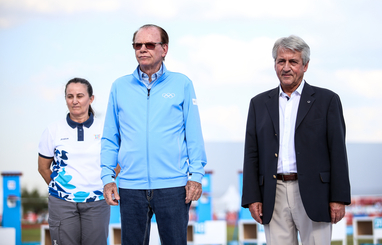 UIPM President Dr Klaus Schormann said: “I must tell you I am very impressed with these Youth Olympic Games, with how it was organised both within and outside of pentathlon, especially on the spectator side where everything is free. “We have thousands of spectators from all generations and that shows what the Youth Olympic Games means for the Olympic movement. “Our young ladies performed well today in good conditions and at the end, we saw how hard they were running to secure the highest possible places. The 2018 Youth Olympic Games pentathlon competition continues on October 14 with the Men’s Individual disciplines of Swimming, Fencing (Bonus Round) and Laser Run. The final medals will then be decided on October 16 with the Mixed International Team competition.